The back roads and byways of off-the-beaten-track Ireland reveal there’s much more to the old sod than blarney stone and Dingle drives. Wandering round the hidden corners of Ireland seems a wonderful notion. Tiny one-pub villages connected by quaint laneways shaded by grand oak trees, picturesque paddocks filled with fluffy sheep, rough stone walls lining isolated farmhouses … you get the picture. Driving the back roads of Ireland should be like a jaunt in the park. My jaunt around the back roads of Ireland begins in Dublin. Heading north from Dublin’s northern suburbs en route to Drogheda and my first stop, the Newgrange tumulus, I make the first of innumerable wrong turns. Believing I’d followed the signs to this ancient Stone Age site correctly, I was wrong, a wrong turn right from the start, my Irish mantra for a week and a half. One phone call later, a stop to ask for location clarification (thank goodness the Irish are mostly friendly, love to chat with strangers and don’t mind providing directions to lost travellers), I pull in to Newgrange’s Bru na Boinne Visitor Centre over an hour late for an appointment. Hustled on to a tourist bus which transports visitors to and from the official visitor centre and the site itself, it heads to the site by the road I had mistakenly used an hour before. If only I’d paid attention to directions indicating all visitors must report to the visitor centre to visit the archaeological site, I would have saved myself an hour of lost time. 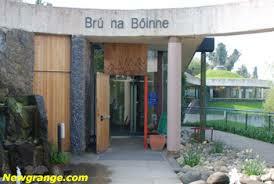 Bru na Boinne Visitors Centre entrance. Newgrange is one of Europe’s most interesting Stone Age passage tombs. A number of tomb mounds mark the surrounding landscape but Newgrange is the largest and most studied. By all means stop for at least an hour at the excellent visitor centre (there’s a decent cafe here too) and read all there is about ancient Ireland in preparation for exploring Newgrange itself. The tumulus’ (mound) history is entirely fascinating after greater understanding of its origin, purpose and importance to early inhabitants is clearly understood. Over each winter solstice, dawn sunlight pierces into the long tunnel directly to the burial chamber itself, illuminating both the symbolic importance of the site’s position and the construction’s wonderfully precise alignment with the sunrise in conjunction with the shortest day of the year. A national lottery is conducted annually which allows a lucky twenty or so visitors access to the tumulus for three days: preceding the solstice, the solstice and the day after, each dawn (if weather permits) opening the tumulus’ greater purpose to the lottery winners. The inner burial chamber is quite small. I’m crowded into it with fewer than fifteen other visitors while we take turns exploring the graves’ positions, wall carvings and the impressive architectural design. The inner chamber is completely dry by the way. No water has ever leaked into the inner chamber, not bad for a roof built over 5,000 years ago by craftsmen using rudimentary tools, even more impressive considering Ireland’s wet weather and harsh climate. From Newgrange I head further north to Carlingford to dine at the Ghan House hotel’s fine restaurant, sampling some of Ireland’s better country cooking at a heritage hotel in this lovely out-of-the-way town on the border. The dining room is comfortably grand, 19th century furnishings, lots of candles, warm service and a dinner far better than I’m used to eating in rural Ireland. Carlingford isn’t big enough in which to get lost but a derelict castle in prime position overlooking the loch evokes feelings of times lost to history. Signage at this castle is scant, much of it is barred from exploration and local residents have used it as something of a trysting place, condom wrappers tossed into stony corners indicating that a lonely castle conveniently located close to the town centre also has advantages other than links to historical roots. From Carlingford I head towards County Monaghan, aiming for Hilton Park, a grand estate where I’m booked to spend a night. The GPS provided by the hire car company is absolutely useless. New roads haven’t been programmed into its system and the border area’s previous political tensions have caused some roads to be purposely left unmarked. I’ve been lost for two hours while searching for Hilton Park. Driven almost mad with frustration at the lack of signage, equipped with a GPS programmed with Irish roads that don’t appear to exist, all the while I’m thinking that if I continue to turn left, an entire circuit of the island nation will be complete, finally reaching my start point. Thoughts of returning to Carlingford’s lovely countryside pop into mind. Should I abandon ship, ditch the car and get a bus back to Carlingford? Not willing to admit defeat so early in the trip, I head for Clones again, doubling back the way I just came. Carlingford, County Louth on the way to ‘The North’. The local postmaster in Clones described the way to Hilton Park an hour earlier. ‘You can’t miss it,’ he says. ‘Well, you could miss it but if you’ve gone past the golf course, you have,’ he adds laconically. I return to the car, point it to the road I’ve driven down twice before and decide to try again. I turn haphazardly into a driveway marked by a sign half hidden by dense holly. The lettering has faded into total obscurity. I chance it anyway. The postmaster told me it wasn’t easy to spot, despite having twice gone as far as the golf course he instructed me not to go past. I’m ready for anything now. Five kilometres along a winding unsealed driveway, I come face to face with a drop dead gorgeous Georgian mansion, a Eureka moment. First view of Hilton Park. While I park the car, already feeling agog with the grandeur of the place, a young man dressed like a county squire strides across the gravel drive that fronts his family home, Hilton Park. Extending his hand in greeting, he says, ‘I’m Fred Madden. You must be Tom. So, you’ve found us. It mustn’t have been easy. How was your trip?’ I’ve been driving in and out of Ulster, commonly referred to as ‘The North’ since my late morning departure from Carlingford in County Louth, part of the Republic, commonly referred to as ‘The South’, wandering blithely around County Monaghan and now I’m right up against the border again. Ulster’s County Fermanagh is only a few miles away. Road maps are next to useless in much of this apparently unmarked country. From one minute to the next, I’m never sure if I’m in Ulster, ‘The North’ or in the Republic, ‘The South’. The northern corner of county Monaghan has been off the radar for decades, deemed by most travellers as being too close to ‘The Troubles’, therefore potentially unsafe. The lack of visitors is a common complaint I hear often during my days in off-the-beaten track Ireland. I also visit County Leitrim and County Westmeath, two other counties virtually ignored by the majority of travellers. I’ve been led to believe that here is where the ‘real old Ireland’ still exists. Hilton Park has been in Madden’s family since it was built in 1734. Since ‘The Troubles’ finished, business in County Monaghan has increased. Hilton Park has reached the 21st century in a relatively healthy position. My bedroom at Hilton Park. Placing a pot of her homemade jam in front of me she continues her summary, ‘Clones is a wonderful town. You know the director, Neil Jordan of ‘The Crying Game’ among other films? He comes to stay here regularly, calls Clones his microcosm of the world. If it doesn’t work in Clones, it won’t work anywhere else, he says.’ Lucy Madden is a raconteur of distinction, a wonderful example of Irish charm and bonhomie. No wonder Jordan enjoys his stays at Hilton Park. Fred Madden shows me around the 600 acre estate. The park and gardens are like a film set. I understand Jordan’s high regard for the place. Expecting to see ladies wearing bonnets and bustles emerge from behind shrubbery at any moment, gossiping dialogue from a Thackeray novel or reciting lines from one of Wilde’s plays, I wonder how this hidden gem has escaped attention for so long, despite ‘The Troubles’. Though my stay at Hilton Park is brief, it is memorable. A small section of Hilton Park’s immense gardens. Ireland is internationally famous for its literary giants, Yeats, Beckett, Wilde to name just a few. Though famous in Ireland, Patrick Kavanagh’s work is less known though the study of his works is compulsory in Irish schools. ‘But I’ve not heard of him before this week,’ I explain to Rosaleen Kearney, manager of the Patrick Kavanagh Centre in Iniskeen, County Monaghan. ‘You’re not alone Tom,’ she says, ‘Patrick Kavanagh is not well known outside Ireland, which is a pity as his poetry is as important to us as Yeats.’ With volunteer guide Art Agnew and Kearney, I explore the Kavanagh Trail, a route marked as a self-guided tour funded by the local tourism authority. Rosaleen Kearney and Art Agnew at Kavanagh’s grave. Kearney and Agnew take turns reciting Kavanagh’s lyrical poetry in their softly burring local accents while we visit Kavanagh’s birthplace, the school he attended, the barn where he waltzed at local dances and finally his grave. ‘The Monaghan hills are hard country and folk here have always been poor,’ Agnew admits sadly. I imagine the land has changed little since Kavanagh was born in Mucker, a collection of houses just a few kilometres from Iniskeen village. Eldest son of a cobbler and farmer of nine acres, Patrick Kavanagh left school aged thirteen to become a cobbler and farmer like his father. What set him apart was his writing, which he did by candlelight in an upstairs room away from the chaos in the family kitchen. Rough country around Iniskeen and Mucker makes or breaks farmers, more often breaking them. From County Monaghan I venture into County Leitrim, another part of Ireland well off the beaten track. This region suffered massive depopulation during the potato famine and the Great Depression of the 1920s. It’s now one of Ireland’s most sparsely populated counties. Wildlife is making a comeback here, fields have been left fallow for decades and birdlife has returned in large numbers. Leitrim Landscapes Guided Walks owner Nuala McNulty covers the county from an environmental perspective. She knows more about the hidden eco-tourism wonders of this region better than anyone. I’ve been walking with her for two hours while the fickle weather takes a turn for the worse. Driving rain prevents us from climbing a nearby hill for its western views over County Sligo to the Atlantic Ocean. Instead we follow a flooded river down a steep valley, past a waterfall, slipping and sliding on smooth stones, exchanging stories about curious characters we’ve met here and elsewhere on our individual travels. McNulty is quick as a whip with an infectious laugh. Just off the path is a tiny shrine devoted to a holy spring, which I’ve overlooked as it’s invisible behind thick shrubbery. McNulty tells me, ‘Springs like this one are scattered about the county and were holy even before St Patrick came along to convert us heathens’, she explains, dipping her hands into the running water. The open sided shrine is large enough to shelter a small child, no more. Rob and Nuala at sacred spring in North Leitrim. From McNulty I learn that Leitrim is a county even the Irish seemed to have forgotten. She adds, ‘No one wanted to live here for ages. Not so now. It’s become something of a new age centre with folk who care about the environment, a good place to live now, not mad like Dublin. People are friendly here.’ Though I didn’t find Dubliners unfriendly, the attitudinal difference between people here and those in Dublin is noticeable, the capital is frantically busy in comparison to Leitrim’s peaceful calm. I spend a lovely night in Roscommon at Mary Gleeson’s Townhouse, the town’s best hostelry conveniently located right in the town’s centre. 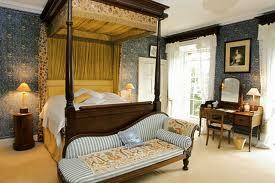 Mary and her husband Eammon run an authentic Irish guesthouse. Comfort and hospitality are king while the small hotel’s restaurant does a booming trade with locals and visitors alike. 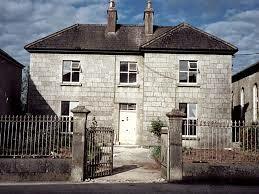 Mary Gleesons Townhouse in Roscommon. Hospitality like this is rare. Mary tells me, ‘You won’t be spending an evening on your own will you? Come join us. We’re going to a play, ‘The Quare Land’. The actors are staying with us. I’m sure you’ll like it.’ The play is funny and timely, all about Ireland’s recent history of land speculation gone mad. We head to the local pub for refreshment afterwards. Eammon insists I sample a broad range of Irish whisky. I can’t say no. 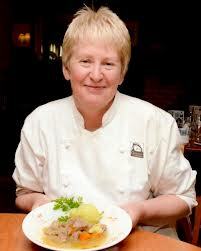 Mary Gleeson with a serving of Irish stew. Bog wood is akin to Irish gold. Petrified forests of oak, yew and Scot’s pine sourced underneath ancient blanket bogs are among Ireland’s most important geological treasures. Little authentic bog land still exists. Much of it has for centuries been mined for peat. Conneely explains that, ‘Irish craftwork and jewellery are making a comeback due to bog wood. I’ve been working with it for years, as you can see,’ she shows me a few of her artfully crafted pieces ranging from necklaces and earrings to lamps and objets d’art, ‘and it’s grand to see a part of our heritage come to life again.’ In no small part due to her efforts I believe. Helen Conneely of Celtic Roots Studio. I make a side trip to Mossfield Organic farm to meet its owners Ralph and Lorraine Haslam, makers of Ireland’s finest hard cheese. Ralph invites me on a tour of his highland property, located almost exactly in the geographical heart of Ireland in West Offaly County approximately ten kilometres from Birr. We meet in Birr before so I can follow Ralph to Mossfield farm. Without Ralph’s help I never would have found his farm. After over a week in rural Ireland, I’ve learnt the hard way to rely on local guidance. Ralph Haslam with a few of his prized cows. 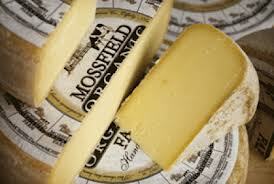 Mossfield cheese is superb. As Ralph explains, ‘It’s all about the milk and happy cows.’ We sample from a number of aged rounds, picking one out of five as the best of a lot. ‘You’ve helped me choose the cheese that’s being served for a state banquet during Queen Elizabeth’s upcoming visit. I hope she likes it, if not I’m blaming you.’ We have a laugh and eat some more delicious cheese. Ralph gives me a few delicately wrapped chunks to take away, typical Irish hospitality. At the farm gate he instructs, ‘Turn right at the crossing, go to the next village, turn left and you’ll be at the main road. The way to Cashel is marked there.’ I never find that main road and it doesn’t exist on the GPS either but I do enjoy munching on the cheese when I pull the car over to a wayside to check my useless map once again. Some of Mossfield’s prize cheeses. Tom Neal Tacker travelled courtesy of Thai Airways, Aer Lingus and Failte Ireland, the National Tourism Development Authority. Thai Airways flies to Europe via Bangkok from most Australian mainland cities. See www.thaiairways.com for details and bookings. Aer Lingus has a comprehensive network connecting Dublin, Cork and Shannon airports to many European and North American cities linked to Thai Airways’ network. See www.aerlingus.com for details and bookings. Hilton Park Luxury House offers antique filled, fabulously decorated historic rooms and excellent cuisine prepared using local ingredients, much of the food from the estate’s garden. See www.hiltonpark.ie for details and bookings. Ard Nahoo in Mullagh, Dromahair County Leitrim is an eco-retreat offering massage therapy and yoga classes in a rustic location with well appointed fully self-contained cottages. 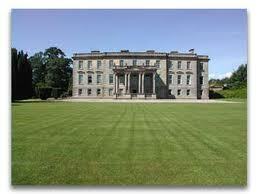 See www.ardnahoo.com for details and bookings. In Dublin, Number 31 Leeson Close is top notch for service, location and accommodation in a Georgian era townhouse. 31 Leeson Close has won awards for best breakfasts in Ireland and is highly recommended. See www.number31.ie for details and bookings. Fantastic piece about Ireland. This country sounds mouth-wateringly beautiful and an extremely desirable port of call, so much so, that I booked a flight to Dublin immediately. I can’t wait to check out your recommended sights and, since I’ll be there during the Dublin Book Festival, I’m going to have my own Irish poetry experience! Thanks for making Ireland a destination too good to miss. Thank you Robyn O’Sullivan for your kind words. Have a great trip to Ireland and safe travels.